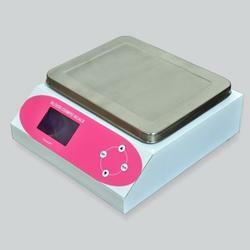 Used for the purpose of measuring the quantity of blood collected, the offered range of Blood Compo Scale provides unmatched performance. The range provided by us is known for its commendable and long-term functionality. Further, we offer this range at the best possible prices. 2. Display on Graphics LCD while measuring Components Volume/weight. · Set Volume of component. · Process value of component in ml. · Process value of component in gm. 3. Display on Graphics LCD while the seating the volume of Blood Component. · Plasma, Platelet, Blood, RBC &WBC. · Set Volume of each component. 4. Easy conversion of Weight & volume. 5. Tare provision to account the weight of Blood Bag. 6. Display volume and weight of Blood Components –Plasma, Platelet, Blood, RBC & WBC. 7. Continues display of selected component by LED. 2. Motor activated clamping at the end of the process, mounted in Elctronic Plasma Expresser. 3. Audio-visual alarm at the end of process. Looking for Blood Compo Scale ?